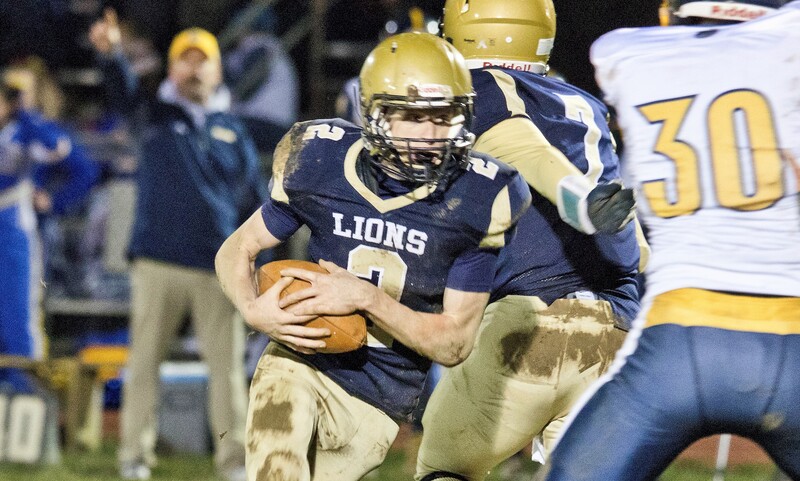 SHIPPENVILLE, Pa. – It was a record-breaking season for Clarion-Limestone junior running back/defensive back Austin Newcomb, and it helped earn Newcomb the 2018 Jim Kelly Award as the District 9 MVP presented by Eric Shick Agency (Nationwide Insurance) and D9Sports.com. Despite missing the equivalency of one full game, Newcomb set the District 9 single-season rushing record with 2,627 yards on 254 carries, an average of 10.3 yards per carry. He ran for 35 touchdowns on the season. Newcomb added 25 catches for 572 yards and five touchdowns and scored three additional touchdowns giving him 43 total touchdowns, two shy of the D9 record of 45 set by Clearfield’s Dave Richards in 2002. In addition to his touchdown, Newcomb also scored 20 two-point conversions giving him 298 points scored on the year out of the 508 scored by the 9-3 Lions (58.7 percent). A force on defense as well, Newcomb averaged 7.1 tackles per game from his safety position and intercepted three passes while also causing two fumbles, recovering a fumble, blocking a field goal and breaking up five passes. 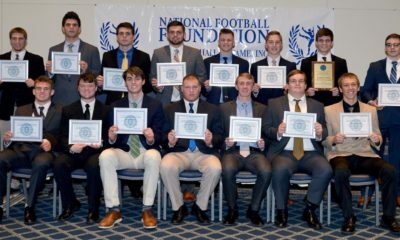 Joining Newcomb in being honored with major postseason awards are Clearfield’s Isaac Rumery as the Offensive Player of the Year, Ridgway’s Evan Furlong as the Defensive Player of the Year, Ridgway’s Gabe Watts as the Rookie of the Year, Jack Krug of Brookville for Individual Performance of the Year, Clearfield’s Tim Janocko as Coach of the Year, Clearfield’s Quentin Bloom as Offensive Lineman of the Year, Brockway’s Zane Puhala as Special Teams Player of the Year, the Brockway/Ridgway District 9 Class 2A title game as the Game of the Year and Mike Maslar as the Special Contributor of the Year. Information on all of these award winners is listed below. In addition to the major awards, The Eric Shick Agency D9Sports.com All-District 9 Football team was also announced (see below). Kelly is a 1978 graduate of East Brady High School (now part of the Karns City School District) where he threw for 3,915 career yards and 44 touchdowns and also scored over 1,000 career points in basketball while averaging 23 points and 20 rebounds as a senior. He went to college at Miami (Fla.) and then played in both the USFL for the Houston Gamblers and in the NFL for the Buffalo Bills. 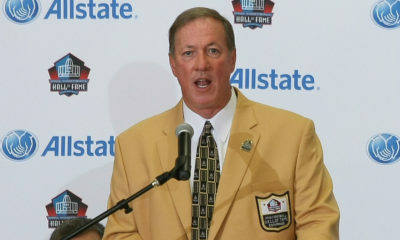 He led the Bills to four straight AFC Championships and was elected to the Pro Football Hall of Fame in 2002. The District 9 MVP award was named after Kelly, with his permission, in 2014. The Eric Shick Agency has been proud to serve Ford City, New Bethlehem, Brookville and the surrounding communities since 1992. Offering insurance and financial services. The Eric Shick Agency can be reached at 814-275-2210. Nationwide is on your side. Eric Shick is a 1987 graduate of Union High School and a 1991 graduate of Clarion University. More information on the Eric Shick Agency can be found at https://agency.nationwide.com/eric-d-shick-in-new-bethlehem-pa/our-agency. Offensive: 254 carries, 2,627 yards (10.3 yards per carry), 35 TDs; 25 catches, 572 yards, 5 TDs. The 2,627 yards were a single-season District 9 record. Scoring: Scored 43 total touchdowns and added 20 2-point conversions giving him 298 total points scored. The 43 touchdowns were two shy of the District 9 record of 45 set in 2002 by Clearfield’s Dave Richards. 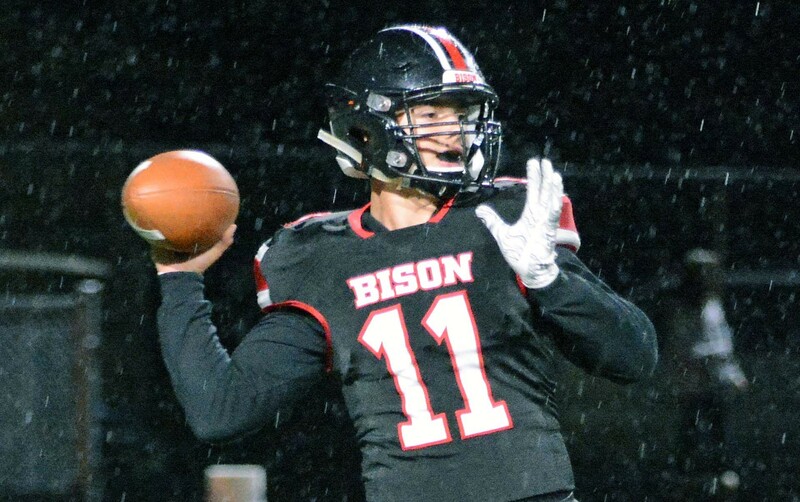 Isaac Rumery – Sr. QB, Clearfield: Rumery, who is headed to Penn State as a preferred walk-on, was a dual-threat quarterback for the District 6-9 Class 4A champion Bison. He completed nearly 70 percent (122 of 176) of his passes for 2,526 yards and 26 touchdowns while throwing just five interceptions. He also added 86 carries for 554 yards and 13 touchdowns while helping Clearfield go 12-1 on the season. 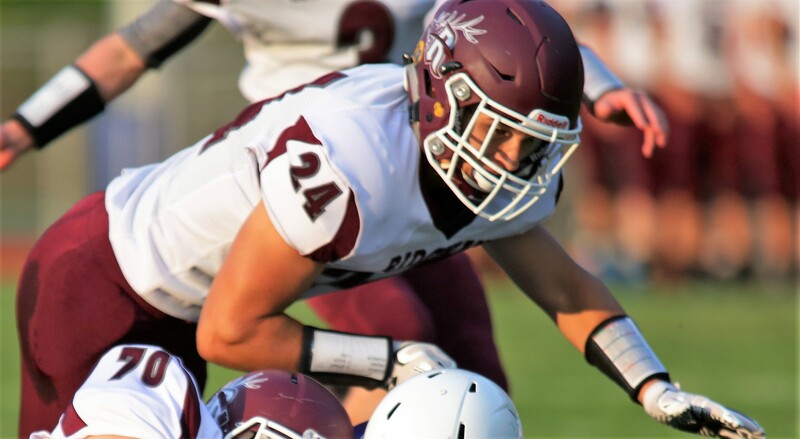 Evan Furlong, Sr., LB, Ridgway: Furlong, despite missing some time with an injury, was a force on defense for a Ridgway team that allowed 13.5 points per game including just 10 points per game against D9 opponents. He averaged a team-leading 9.3 tackles per game in nine contests with four sacks. 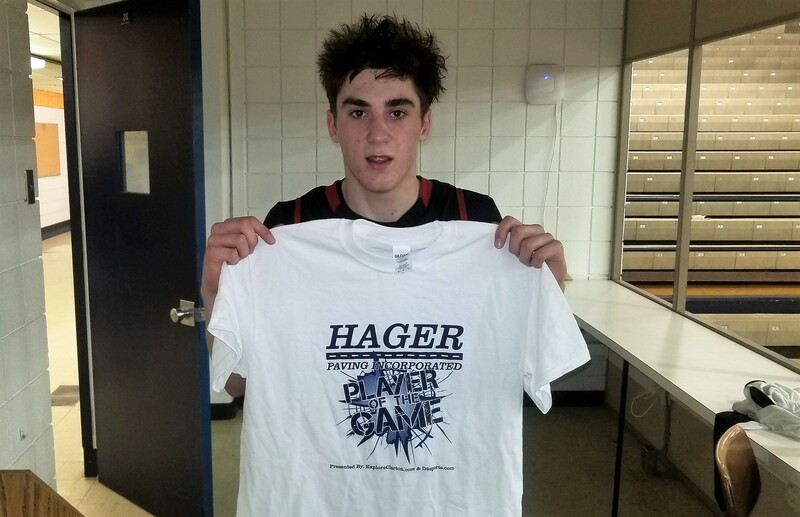 His influence can be seen in the fact that in the eight games against D9 opponents that Ridgway played with him in the lineup, the Elkers gave up nine points per game while in the four he missed Ridgway gave up an average of 12 points per contest. 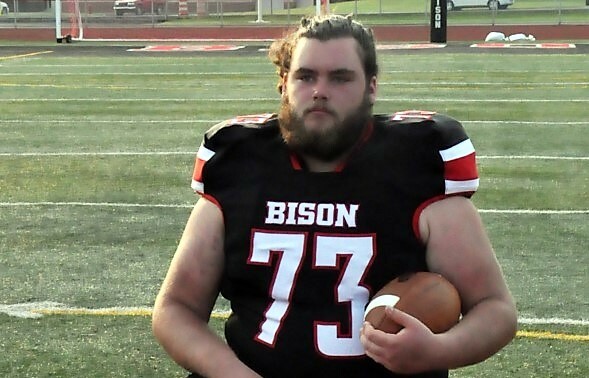 Quentin Bloom, Jr., Left Guard, Clearfield: Bloom, a 6-foot, 307-pound left guard, was a force on a Clearfield offensive line that allowed the Bison to average 435.3 yards and 43.8 points per game while winning the District 6-9 Class 4A title and finishing 12-1. He helped open holes for a pair of 1,000-yard rushers (Brett Zattoni and Calen Freeland), kept a 2,500-yard passer (Isaac Rumery) clean and was a big reason why Clearfield had a 1,000-yard receiver (Jake Lezzer) and another receiver with 996 yards. Gabe Watts, So., RB, Ridgway: Watts burst onto the scene in 2018 and ended up leading Ridgway in all-purpose yards with 826 while accounting for 923 offensive yards. He was the leading rusher for the Elkers with 747 yards and a team-best 10 rushing touchdowns on 117 carries (6.4 yards per carry) while adding 13 catches for 79 yards and going 6 of 11 passing for 97 yards. He also was the primary punter for Ridgway and earned All-Conference honors at that position. Zane Puhala, Sr., K, Brockway: Puhala had a strong year for the Rovers as an added offensive weapon. 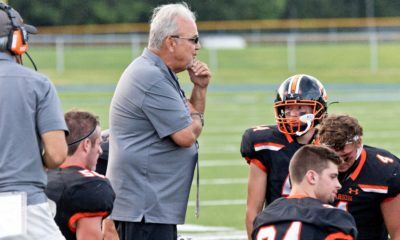 He made nine field goals, including three of at least 30 yards with a long of 36 and was 38 of 40 on extra-point tries while his kickoffs constantly helped Brockway win the field-position battle. In the season opener at Karns City, his 30-yard field goal with 2:50 to play lifted the Rovers to a come-from-behind win. Tim Janocko, Clearfield: Janocko led the Bison to a 12-1 record and the District 6-9 Class 4A title. This was a six-win improvement from a year ago when Clearfield went 6-5, and it was the Bison’s first title since 2015 and its first sub-region title since 2013. 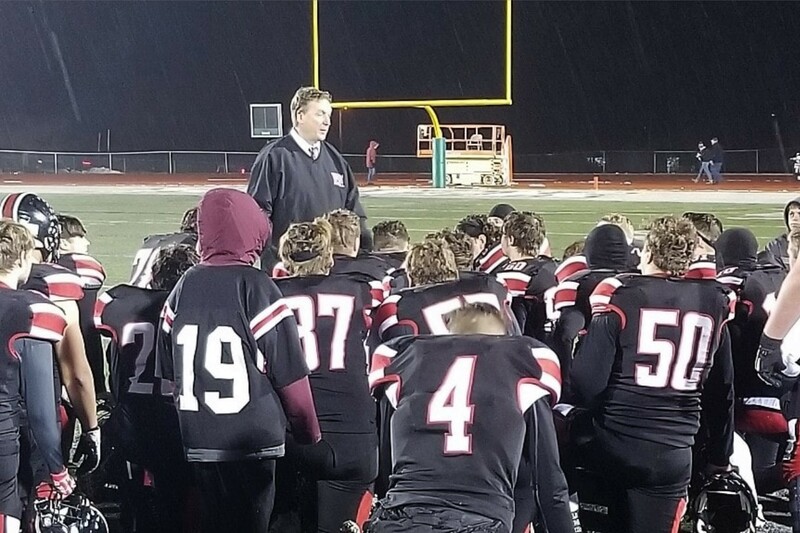 Under Janocko and his staff direction, Clearfield had a 2,500-yard passer, two 1,000-yard rushers, a 1,000-yard receiver and another receiver who finished four yards shy of 1,000 yards. Clearfield’s only loss came to Erie Cathedral Prep, winners of the past two Class 4A titles, and the Bison played with the Ramblers until some key injuries started taking a toll late in the first half. It is the second time Janocko has earned District 9 Coach of the Year via D9Sports.com. 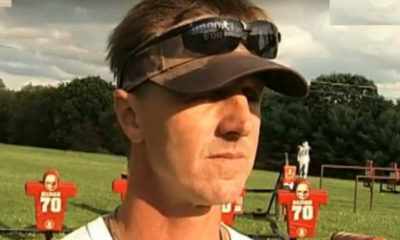 He was also Coach of the Year in 2010. 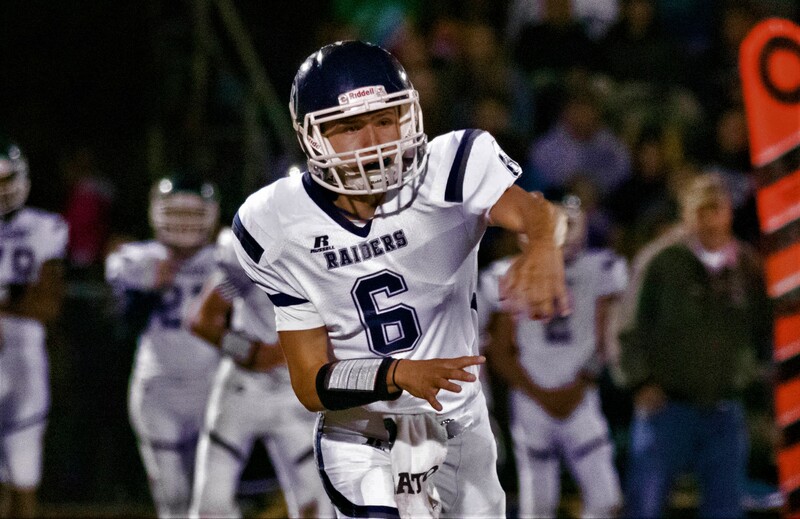 Jack Krug – So., QB, Brookville: In a season-opening 69-60 Raiders win over visiting Bradford, Krug, who also won this award as a freshman last year, threw a school-record eight touchdown passes while accounting for nine total touchdowns and 693 yards of total offense. He was 30 of 50 passing for a school-record 555 yards and the eight scores, which broke a 50-year old school mark. He also ran the ball 14 times for 138 yards and a touchdown. 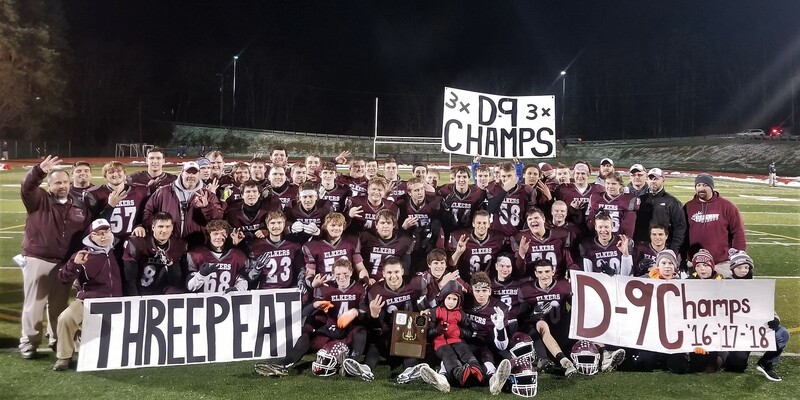 Nov. 19, 2018 – Ridgway 14, Brockway 7, District 9 Class 2A Championship Game: A late-fall snow/ice storm forced the postponement of the District 9 Class 2A title game from Friday in DuBois to Monday in Karns City, but the wait was well worth it for this instant defensive classic. It was a throwback defensive struggle with the team accounting for just 353 total yards of offense combined. Brockway took a 7-0 halftime lead on a 6-yard Peter Downer to Connor Ford touchdown pass and held that lead until early in the fourth quarter when Jake Wickett tied the game for Ridgway on a 16-yard run that was followed by a Daunte Allegretto PAT with 10:28 to play. Brockway had a chance to retake the lead late in the fourth quarter when it moved the ball to midfield. But facing fourth-and-4 from the Ridgway 49-yard line, the Rovers decided to go for it. A pass from Downer to Josh Solnosky along the sideline was incomplete giving Ridgway the ball back with 2:49 to play. Ridgway then appeared to get a chunk play on a pass inside the 20-yard line, but an illegal man downfield penalty brought it back. It didn’t matter, as Paul Gresco threw a 16-yard screen pass to Gabe Watts that got the ball to the Brockway 29-yard line. Gresco then threw a pass to Daunte Allegretto to the 9-yard line and found Allegretto again to the 6-yard line. 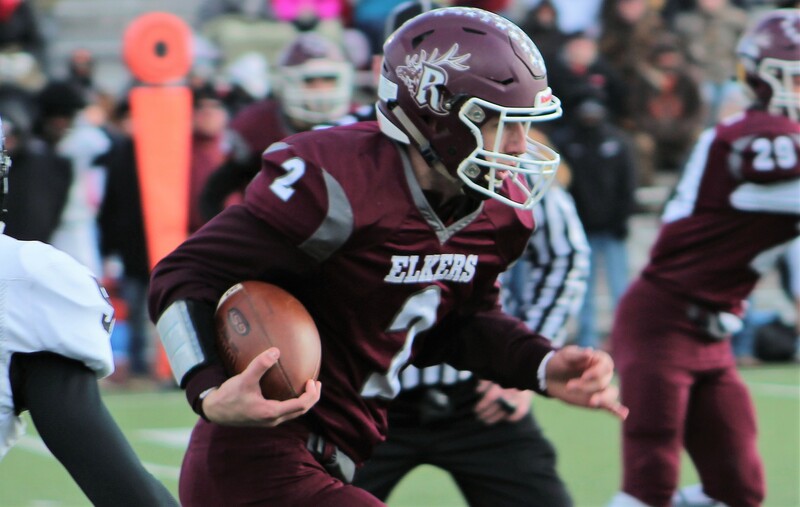 From there, Matt Dush went six yards for a touchdown with just 25 seconds to play to give Ridgway its third straight D9 title and its first in Class 2A after winning in 2016 and 2017 in Class 1A. Wickett (80 yards rushing) and Watts (76 yards rushing, 27 receiving) led the offense for Ridgway with Gresco going 10 of 20 passing for 85 yards and Allegretto catching three passes for 28 yards. Tyler Serafini led Brockway with 73 yards rushing while Downer was 7 of 17 passing for 68 yards and two interceptions. Jon Wood caught four passes for 46 yards. Issac Schloder and Austin Green had the picks for the Elkers. 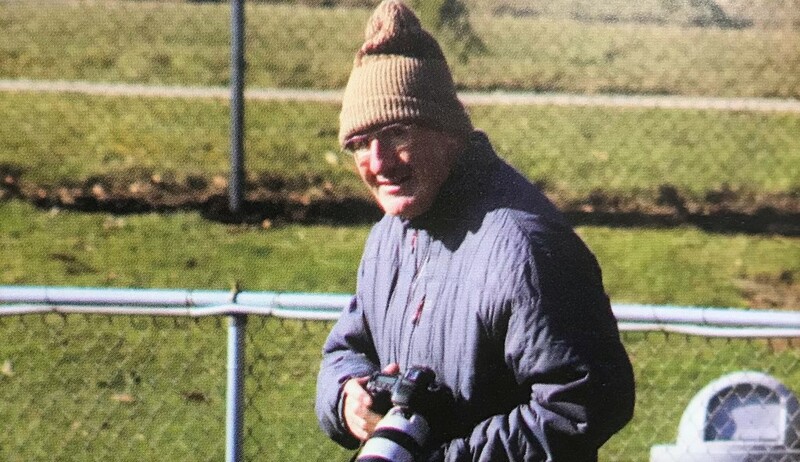 Mike Maslar: Maslar is a former teacher at Redbank Valley and has been taking pictures of various Redbank Valley and other athletic events for nearly five decades even after retiring from Redbank Valley in 2009. He is at virtually every Redbank Valley sporting event with his camera in hand serving as the unofficial photographer for Redbank Valley athletics. While a teacher, Maslar would display his pictures in his classroom and then give them to the athletes at the end of each week. Now, he comes to the school once a week to display new pictures in a display case, all of which he prints at his own cost. He then gives them to the coaches to distribute to the kids. Maslar has also been known to take pictures of Redbank Valley opponents and give them to those respective athletes as well. Much more on what Maslar has done can be found here.